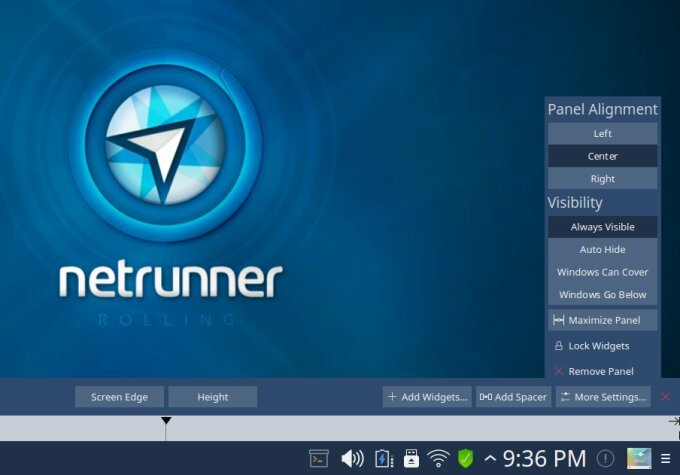 Netrunner Rolling is a weird distro. 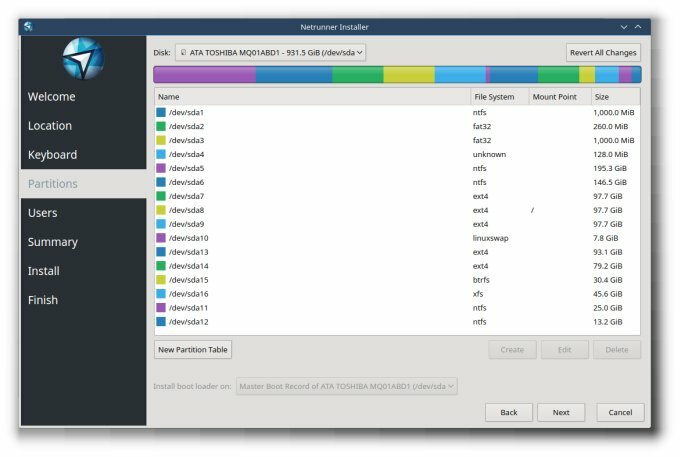 Unlike the bi-annual main release, it does not rely on Ubuntu and its siblings for the majority of its code. 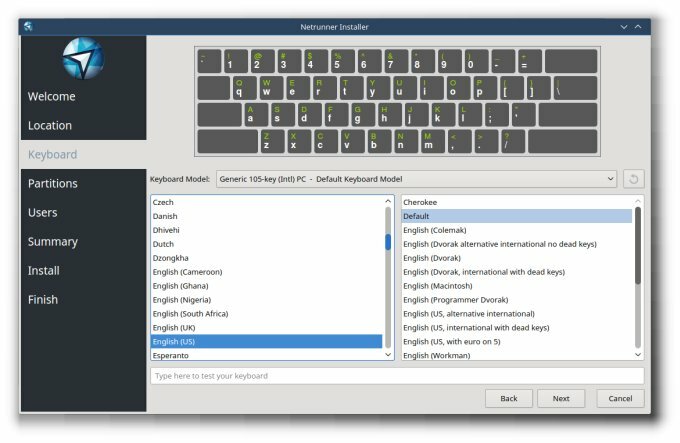 Rather, it wanders into the darker, less popular corners of the Linuxosphere, where Arch and Manjaro lurk. But we don't mind. Plus, it's the distro testing season! I've tested this flavor twice, both times last year, and my impressions were mixed. The first time, the distro was quite decent, less so the second time around. Armed with a brand new test laptop and passion, I set about giving Netrunner Rolling a third chance. Let's see what gives. Physically. Yes. In anger. Why, you may ask? Well, without going into too many details, the live session and the subsequent installation did not go well. 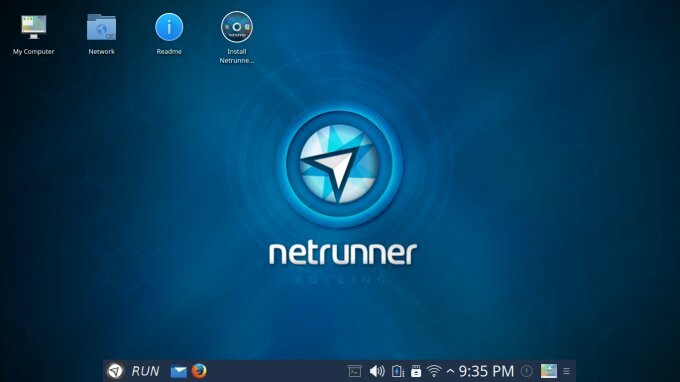 The Plasma desktop crashed five times, lots of the usual stuff flaked or did not work, the installer failed to format the target root partition, and then got stuck the second time around along with the network stack. I was so frustrated that I hard-rebooted the machine WITHOUT saving the screenshots. Yes, I lost roughly two hours of evidence of my hard work and testing. At this point, I was so livid, I literally contemplated tossing the laptop out of the window and watching it shatter against the pavement below. Instead, I booted Netrunner Rolling one more time and repeated the entire sequence from scratch. Luckily for me, all of the problems are entirely reproducible, so let's see them. 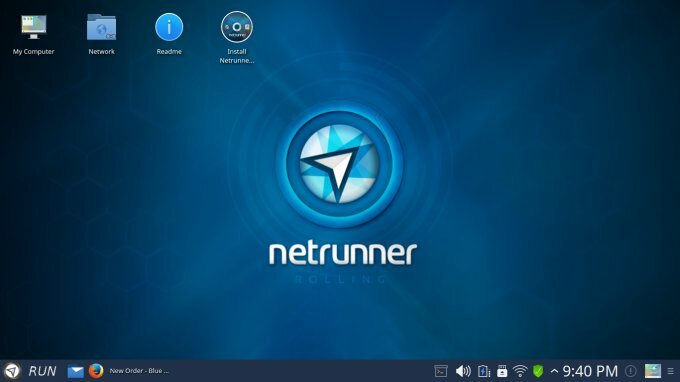 Netrunner Rolling 2015.11 comes with a very pretty, unique Plasma desktop. The stuff you like, and then some. The icons and windows decorations are very pretty. There's a nice mix of flat and abstract, there's color and cool everywhere. Extremely well done on the aesthetics front. 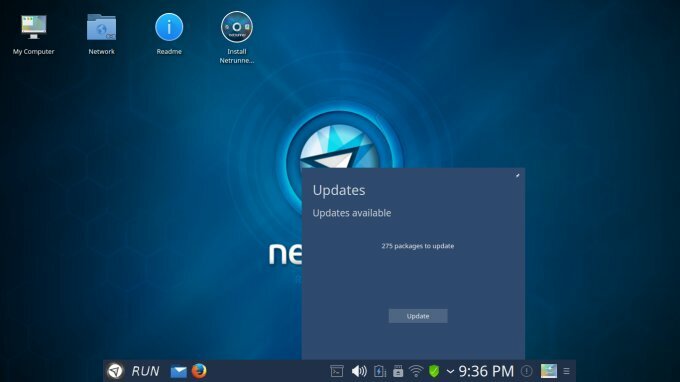 It also offered updates, in the live session. The bottom panel is centered, which is the one thing I would change and have it stretched out across the entire width of the screen, as I promptly did 71 seconds into the review. Other than that, Plasma be plasmin', all bells and whistles like. A mixed bar bowl of peanuts, after they have been thoroughly touched and probed by a hundred men stepping out of the gents without washing their hands. Wireless was working for a while - until it died during the installation. Coincidence or not, this reminds me of the Realtek bug that should not be there. Bluetooth is completely borked. There's no way to turn it on. Samba sharing was working, more or less. 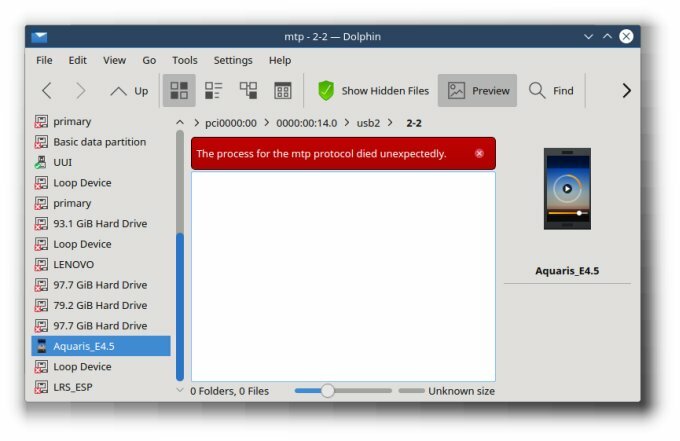 Now and then, Dolphin would protest and fail to connect to the shares. 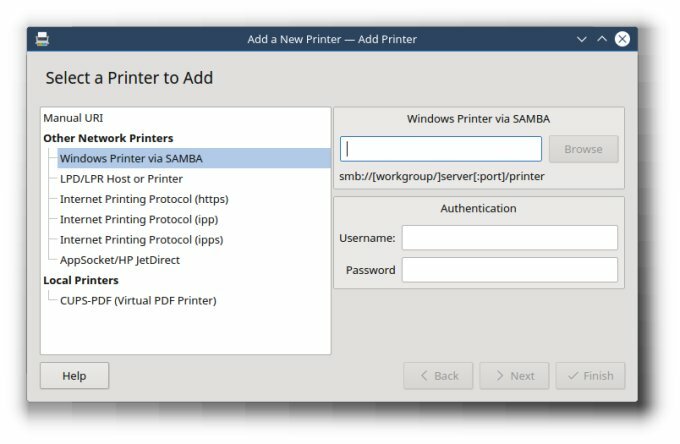 Samba printing is an option listed in the printers applet, but it is grayed out. One big nope really. First, it completely did not recognize iPhone. As if the device does not exist. Then, after connecting my Ubuntu Phone, it started complaining about missing PCI devices, the MTP protocol dying suddenly and such. Eventually, I was able to mount the phone and use it, but it's like saying you can eat ice cream by licking it off the ground. I have no complaints on this end. Everything worked. You get all the necessary plugins and codecs. Firefox was behaving nicely, and it comes with fewer extensions than before, making the choices that less controversial. Ipso facto, Flash and such. 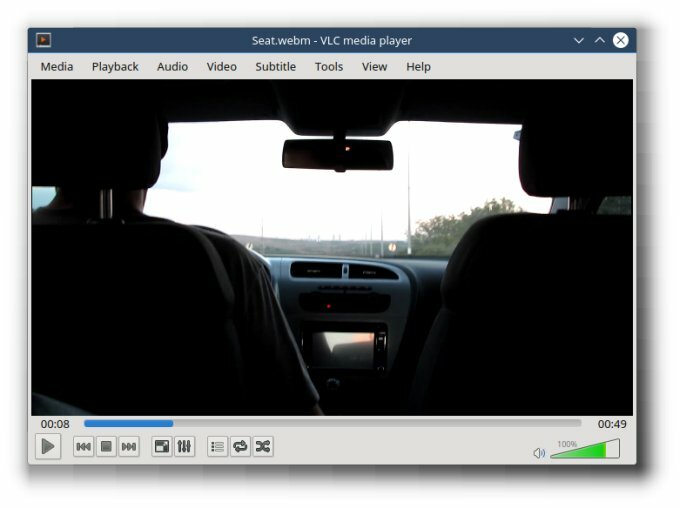 HD video, too. MP3 worked, but the default music player still baffles me. Why would you have Audacious, skinned like WinAMP, when you also have VLC and three or four other programs, all capable of doing the same thing? It's a functional overkill. 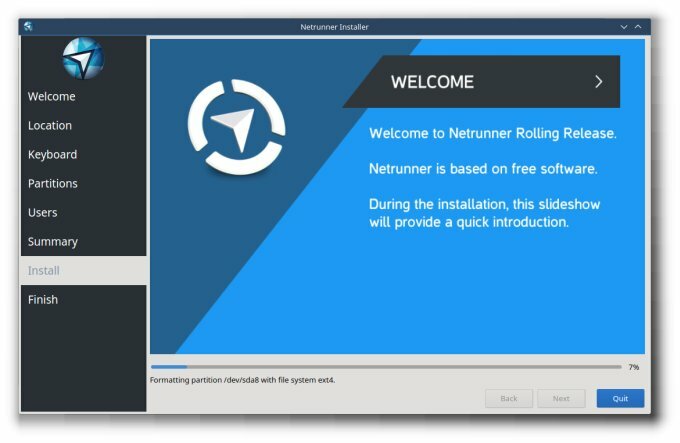 The one thing that is immediately noticeable about the installer is that it takes about two whole minutes to launch. Double click, wait. Fully repeatable. Fully stupid. Then, once it's actually finally running, 'tis a curious beast. 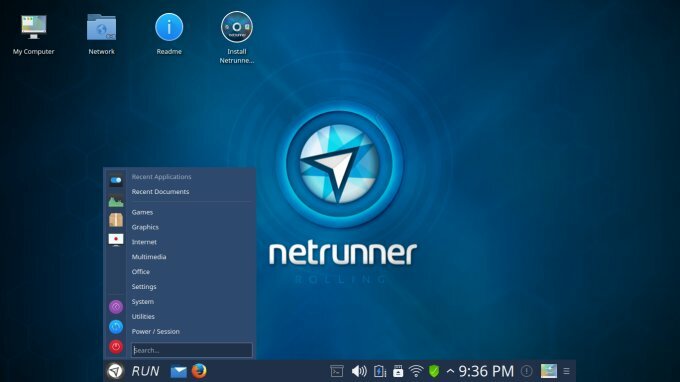 It is different from Kubuntu, and you setup your user and such before the actual installation. Moreover, it is also very pretty and neat. But it is not exactly friendly. 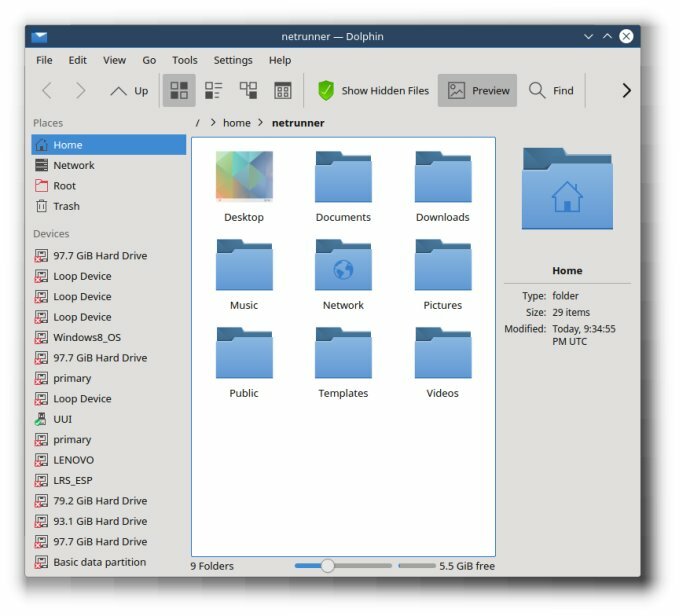 For instance, the partitions have no labels, and if you have a setup like mine, with no less than 16 partitions shared across eight or nine operating systems, it can get confusing. Then, when you click Next, you will be forced to wait another two minutes or so. If you are impatient and double-click or multi-click or whatever, you will skip the Summary page. Whatever you do, the installer will fail. It will not be able to format the target partition, and you will have to relaunch the installer. This happened to me on both occasions, including the first time when I lost my screenshots. You will have to repeat everything. This time, you won't get the formatting failure. The installation began eventually. The slides come with a very nice color scheme. Retro 60s like, but the font scaling is all wrong. The images used for the slides template are probably designed at a different size than the eventually output. The installer worked diligently for about 15 minutes, and then it reached the dreaded 21% mark, just like the first time. It stayed there for a while, not doing anything useful. At the very least, the network was still working, unlike the first time. And then, as expected, the installer died. This was the second and final time. More than enough mercy for one little distro. Thus endeth the review. Oh yes, I hate Python. Even its errors are totally ugly. The added bonus is, your system is not bootable now. Congratulations, you will now have to restore your bootloader, and we all know this is a fun and loving activity that will infuse your heart with joy. 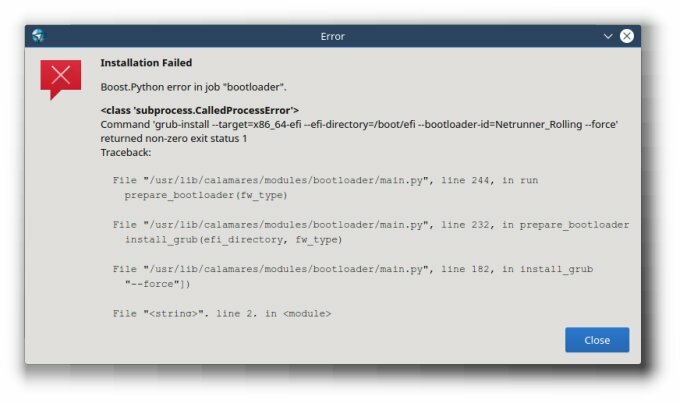 Literally, this has probably been the worst distro experience I've had this year. Some other operating systems simply refused to boot or such, but they did not frustrate me this much, did not give me false hope, and did not ruin my box too much. Netrunner Rolling 2015.11 did its best to completely obliterate any goodwill there could be. I don't know why or how and when, but so far this autumn, both Plasma desktop failed miserably. 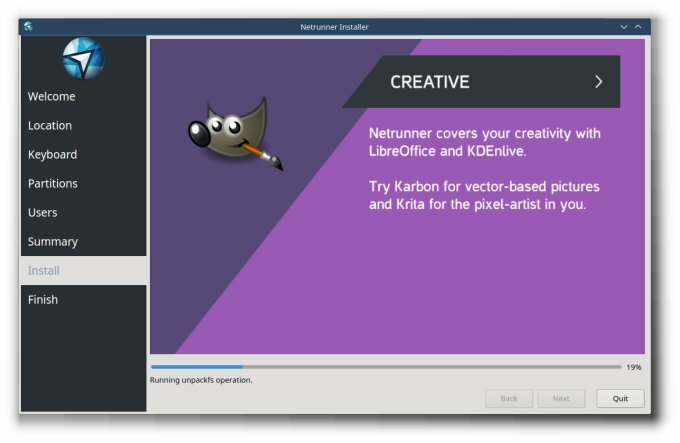 Kubuntu Werewolf is a flop, all other Ubuntus are rather mediocre, and now this. Exactly the kind of thing that makes people forsake Linux forever. Luckily, I have a little more stamina, but after all my happy preaching about Plasma, well, I feel like an utter idiot. Moreover, the sheer inconsistency is absolutely maddening. Then, having a rolling distro is pointless if you roll into a disaster. Anyhow, 0/10. I'm out.